As I see it, this is an interesting development. First, Adidas appears to be making a much bigger statement about the potential impact of minimalist shoes on their market than any of the other major brands have dared do - Nike Frees are NOT minimalist or "like barefoot". I don't care what Nike say. 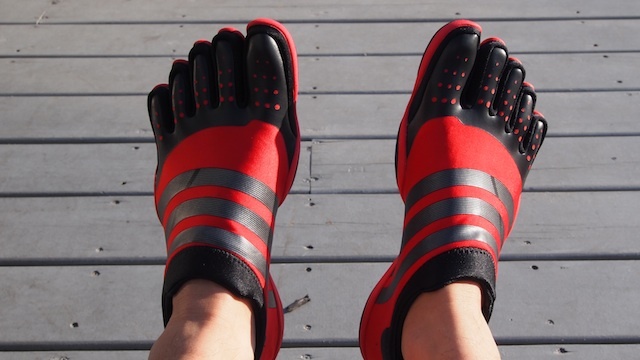 Secondly, Vibrams are currently suing Fila for patent infringement. Has Adidas licensed these patents from Vibram or are they going in guns blazing and hoping to dig themselves out when the pooh when it hits the fan? I've already got 3 pairs of Vibram Five Fingers (VFF) and really enjoy running in them. I also quite like the look of these new Adidas Adipures and if the planned price is anything to go by, they'll be offering a good alternative to VFFs at a comparable price. The pictures and the Gizmodo review however concern me a bit: they seem to indicate a fair bit of cushioning so I'd like to try these on before coughing up my cash.